This video from the Pollak Library at California State University, Fullerton, offers an introduction to citing information found in books and articles, and to managing citations. The OWL Purdue's Online Writing Lab for MLA. The OWL Purdue's Online Writing Lab for APA. The OWL Purdue's Online Writing Lab for Chicago Style. Son of Citation Machine Free Citation Generator. Zotero Citation Manager Free Download works in your Firefox browser to collect, manage, and cite resources for you. Citing: Also called documenting or referencing. The recording of information (e.g., author, title, publisher, publication date, page numbers, database name, URL address, etc.) from a source (e.g., book, magazine article, web site) which allows an instructor or anyone to identify and locate a source. By citing your sources, you are also giving proper credit to those sources. This information is then formatted to a citation style (e.g., APA, MLA, Chicago) specified by your instructor and inserted into your essay. Common knowledge: Facts or ideas that are well know by many people and that can be found in numerous sources (e.g., Barack Hussein Obama II served as the 44th President of the United States from January 20, 2009, to January 20, 2017.). Quotation: Also called a quote. Using someone's exact words. When you use a direct quote, place the passage in quotation marks and cite the source according to the citation style specified by your instructor (e.g., Using a direct excerpt from Barack Obama’s January 2009 inaugural address). Paraphrasing: Using someone's ideas, but putting them in your own words. This is probably the skill you will use most when incorporating sources into your writing. Although you use your own words to paraphrase, you must still cite the source of the information (e.g., Using an excerpt from Barack Obama’s January 2009 inaugural address and putting it in your own words). This tutorial was adapted from Robert A. Harris's book The Plagiarism Handbook : Strategies for Preventing, Detecting, and Dealing with Plagiarism, Los Angeles, CA : Pyrczak Publishing, 2001. Many of the materials contained on this page come from a LibGuide created by the librarians at J Sargeant Reynolds Community College, Richmond VA.
Great handout for instructors to give to students! Another person's idea, opinion, or theory. Direct quotes from another person's actual spoken or written words. Paraphrasing of another person's spoken or written words. Enables a reader to locate the sources you cited. Demonstrates the accuracy and reliability of your information. Shows the amount of research you’ve done. Strengthens your work by lending outside support to your ideas. Turning in someone else’s paper as one’s own. Turning in a paper that was bought from a service on the Internet. 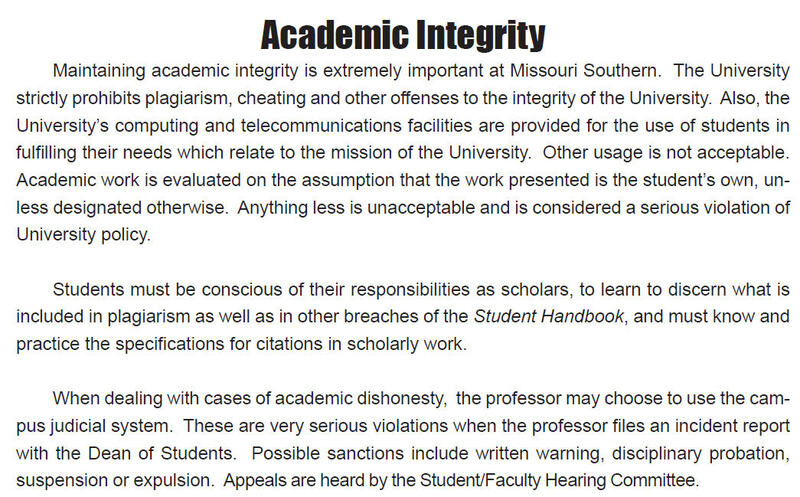 Reusing a paper previously turned in for one class and then submitting the same paper or portions of it for subsequent classes without permission of the instructor (self-plagiarism). Cutting and pasting entire sections from other authors’ works into one’s own paper. Using another author’s exact words but not putting quotation marks around the quote and citing the work. Failing to differentiate between common knowledge and something that needs to be cited. Failing to include complete and correct citations. Sticking to closely to another author’s words by only changing a few words around when paraphrasing. Using another author’s exact words but not putting quotation marks around the quote even if one cites the work. Make sure to place direct quotes from another person in quotation marks. This is especially important to remember when you are taking notes from any source you use. Make sure to copy the words exactly as they appear in the source. When you paraphrase, be sure you are not just changing or rearranging a few words. Carefully read over the text you want to paraphrase. Write out the idea in your own words. Check your paraphrase against the original text to make sure you have not accidentally used the same phrases or words. Make sure to include complete and correct citations in your works cited list. Make sure to follow the guidelines and rules for the citation style specified by your instructor (e.g., APA, MLA, Chicago). Make sure to include in-text citations within your paper for any information taken from another person’s work. A typical in-text citation includes the author's last name and the page number of the source. The in-text citation is inserted at the end of the last sentence containing a quote or paraphrase of another’s work - example: (Jones, 127). Check with your instructor or a librarian for other in-text citation examples. Easily manage & organize your research and writing efforts. Create an account to export journal article and book citations and automatically insert references into your papers to generate formatted bibliographies in seconds. For more information see our RefWorks LibGuide. Login to your Missouri Southern State University RefWorks account.